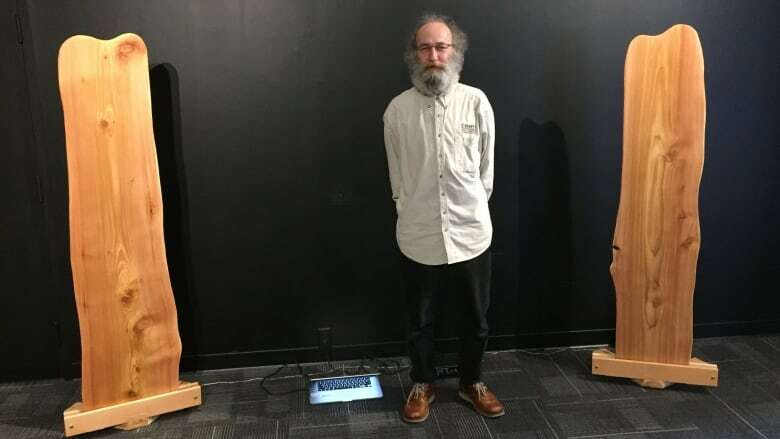 Composer Giorgio Magnanensi has built loud speakers out of maple and cedar. Artistic director, composer and conductor Giorgio Magnanensi has designed himself a unique set of loud speakers you'd be hard pressed to find anywhere else. Magnanensi made his loud speakers out of cedar and maple wood. The "resonators," as he calls them, stand almost a metre-and-a-half tall and about half a metre wide. The resonator's edges are wavy and smooth, knots and imperfections are scattered around the grain of the wood. Magnanensi made the resonators out of reclaimed wood that was discarded by a mill near Sechelt, B.C., where he lives. When Magnanensi learned the wood was to be burned at the end of the logging season, he asked if he could take some of it instead. "I was so stunned to see how much wood is wasted this way," said Magnanensi. "This wood is beautiful, and when you hear the sound, it is a living thing." Magnanensi said he became enamoured with the sound the wood produced when fashioned into resonators. The technology of the speakers is based on a very old method of making music, one common in string instruments like the violin. When a violin's strings vibrate, the vibrations transmit to the bridge of the violin. The bridge acts as a transducer between the vibration of the strings and board of the violin. This makes the violin resonate and produce sound. The difference with Magnanensi's resonators is that his transducer is an electrical component he plugs into his computer or any other source of audio. Music from Mangnanensi's laptop plays through the transducer where it is passed onto and rendered by the wooden resonators. "The sound is diffusing into the board and the wood becomes alive and vibrates," said Magnanensi. Magnanensi said he only spent about $100 on his resonators rather than thousands of dollars on a new set of speakers. He called them a testament to how much our society has and how much it wastes. The wood Magnanensi took from the mill was from the edges of trees. That wood is the youngest wood on the tree and therefore the most porous. The porous quality of the wood is what makes it resonate so nicely. The resonators are being showcased at an installation at the UBC Centre for Interactive Research on Sustainability from March 4 to 10. During that time, there will also be performances using no fewer than sixteen of the resonators.